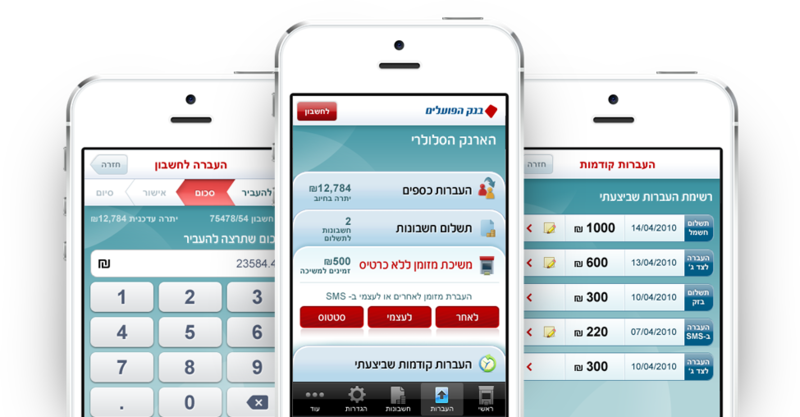 Hapoalim Bank decided to develop a Mobile Wallet iPhone application because of their desire to provide their clients with an innovative UX experience. 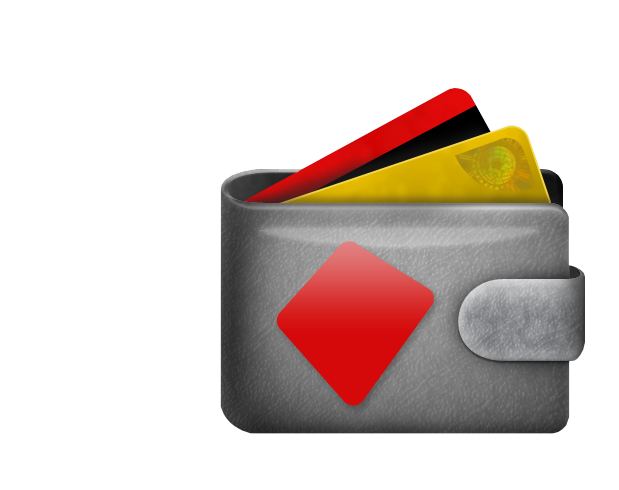 This app, created for the bank's clients, allows users to pay bills, transfer funds, and make withdrawals quickly and efficiently through the device without using a magnetic card. 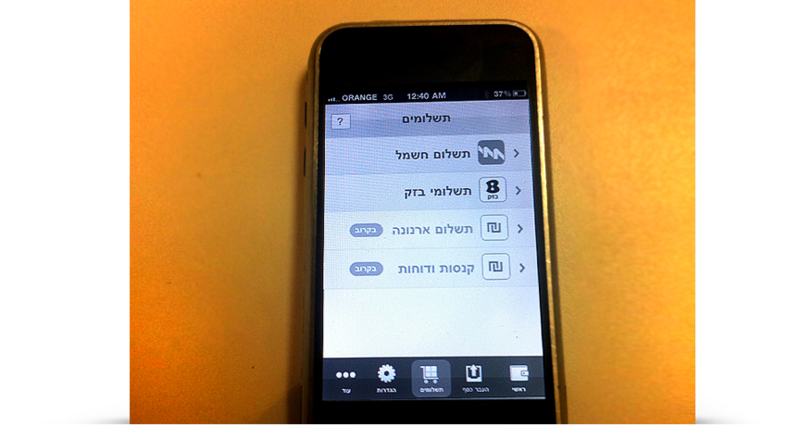 Among other features, the app uses the "Bump" feature to transfer funds between iPhone owners. 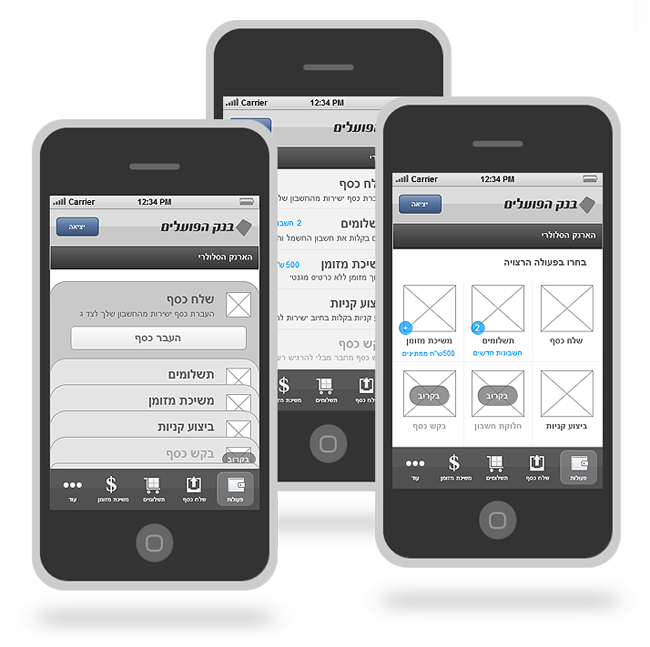 I was responsible for the preliminary research, UI design and usability testing in this project. I believe in offering at least three concept options for each project, emphasizing the advantages and the disadvantages of each option with regard to the research and design processes. 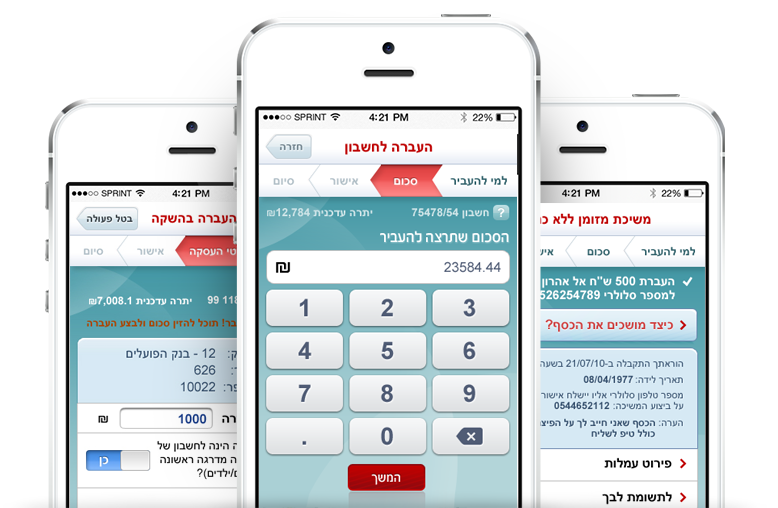 After presenting the three directions to Hapoalim Bank with a thorough explanation of the pros and cons of each, the client selected the concept that best fulfilled its goals and suited its users. (Fortunately, it was also the concept I preferred). After completing the app homepage and hierarchy, I began designing the internal pages. The request for these pages was to translate complex processes (as often is the case in finance) into simple actions that can be easily performed on a mobile device. I broke the processes down into separate steps, each containing just one, well-defined action, enabling me to create a process that was both quick and simple. Axure RP is my chosen tool for wireframing. It allows me to create interactive prototypes at an early stage of the process. By the end of this project, I was able to create a functional prototype that could be accessed directly from the iPhone device. The bank employees downloaded my prototype on their personal devices and interacted with it for a few days. This produced useful feedback and insights for improving the UI before moving on to the visual design.